"What are the Proper Postures During Mass?" In the Dioceses of the United States of America, they should kneel beginning after the singing or recitation of the "Sanctus" ("Holy, Holy, Holy") and remain kneeing until after the "Amen" of the Eucharistic Prayer, except when prevented on occasion by ill health, or for reasons of lack of space, of the large number of people present, or for another reasonable cause. However, those who do not kneel ought to make a profound bow when the Priest genuflects after the Consecration. The faithful kneel after the "Agnus Dei" ("Lamb of God") unless the Diocesan Bishop determines otherwise. Some people hold hands during the Lord's Prayer, while others hold their hands out like the priest. Is there a prescribed posture for the Our Father? 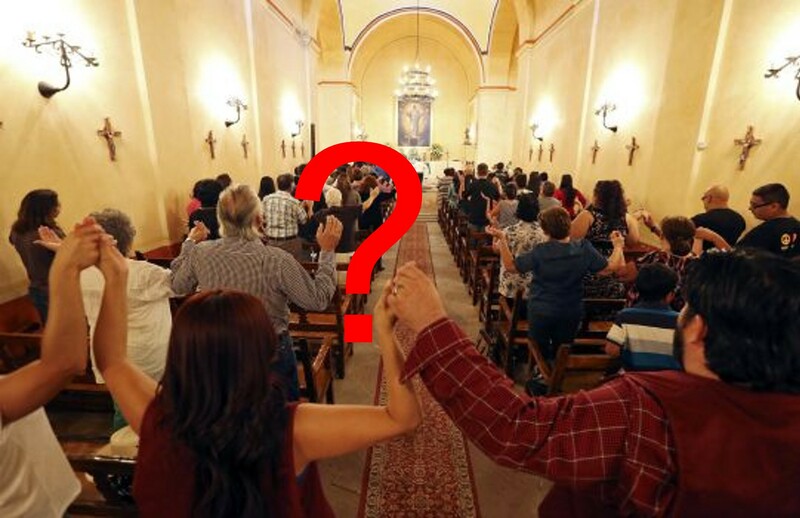 A different case is the practice in which some people adopt the “orantes” posture during the Our Father, praying like the priest, with hands extended. In some countries, Italy, for example, the Holy See has granted the bishops’ request to allow anyone who wishes to adopt this posture during the Our Father. Usually about a third to one-half of the assembled faithful choose to do so. Despite appearances, this gesture is not, strictly speaking, a case of the laity trying to usurp priestly functions. The Our Father is the prayer of the entire assembly and not a priestly or presidential prayer. In fact, it is perhaps the only case when the rubrics direct the priest to pray with arms extended in a prayer that he does not say alone or only with other priests. Therefore, in the case of the Our Father, the orantes posture expresses the prayer directed to God by his children. The U.S. Bishops’ Conference debated a proposal by some bishops to allow the use of the orantes posture while discussing the “American Adaptations to the General Instruction to the Roman Missal” that year. Some bishops even argued that it was the best way of ridding the country of holding hands. The proposal failed to garner the required two-thirds majority of votes, however, and was dropped from the agenda. Fr. Bernard Perkins, OCD, adds, “The Our Father is part of the Communion Rite; it is given to us by Holy Mother Church as a preparatory prayer for the reception of Holy Communion. It was never intended for fellowship. The fellowship takes place during the sign of peace”.